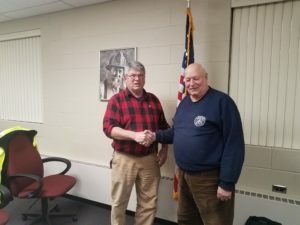 After 25 years as a Commissioner for the Rush Fire District Larry Meston has decided to retire. Larry was a dedicated Commissioner who helped the Rush Fire District in many ways. Two that stand out are insurance issues and truck repair/purchasing as Larry worked for Churchville Fire Equipment for many years. Thank You Larry for your many years of service to the residents of Rush and the Board of Fire Commissioners.